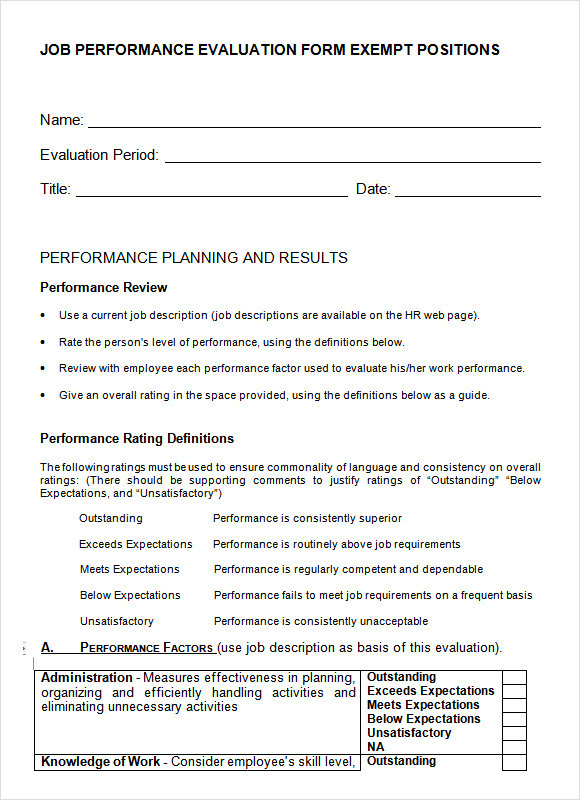 The purpose of Performance Evaluation Forms is to provide basic requirements of evaluation when dealing to performances of employee, staff or people working in the company. It is a valuable tool and a part of performance appraisal necessary to conduct in the business company. 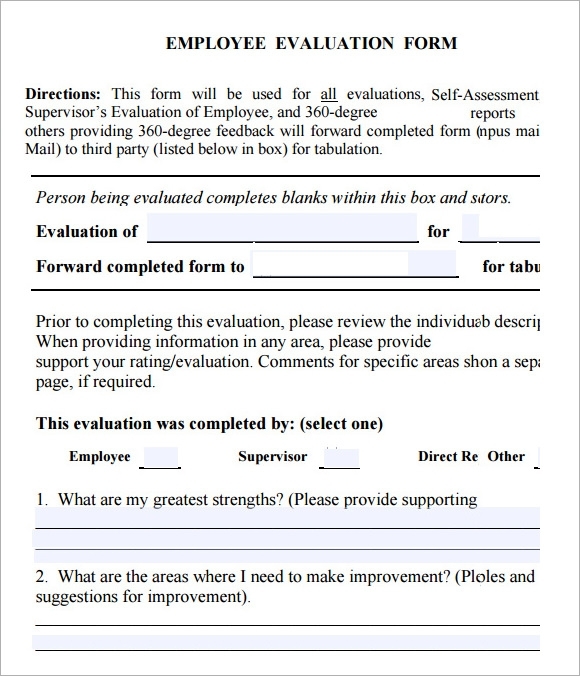 An example for this kind of evaluation form is free and downloadable. The example is seen in website template through online. It is well presented in the Microsoft Word or PDF and once this form is done, it can be print. The performance evaluation form is a structural basis when evaluating a certain performance done by an employee or staff. This is a job performance evaluation form for employees’ exempt positions. There are several parameters based on which an employee’s job performance is evaluated. Depending on this evaluation, an employee receives a rating which plays a great role in his or her promotion, increment, appraisal etc. This is an evaluation form specifically meant for calculating an employee’s overall performance and his contribution to the company. The form mentions a number of factors that need to be considered for such evaluation, including dedication, cooperation, appearance, character and communication. Followed by the employee’s details and information, this template talks about a number of performance traits, and a number of boxes that you have to tick based on the employee’s feat. There are four categories of satisfaction levels that you can tick, whether it is marginal, commendable, proficient or needs improvement. This template aims at evaluating an employee’s performance and goals. With detailed text, it teaches you how to evaluate someone’s performance, and what factors need to be kept in mind. Depending on the results of this evaluation, an employee’s appraisal is determined at the end of a year. Why Do You Need a Performance Evaluation Form? Carrying out performance evaluation of employees is extremely necessary to judge their worthiness to the company. A performance evaluation helps in determining how dedicated an employee is, whether he is serious towards his job or not, and if he should be retained in the office at all. Even if he is worthy, you need to evaluate his performance so that you can give him a well-deserved appraisal. If he is not worthy, you can skip the appraisal and give him a warning instead. 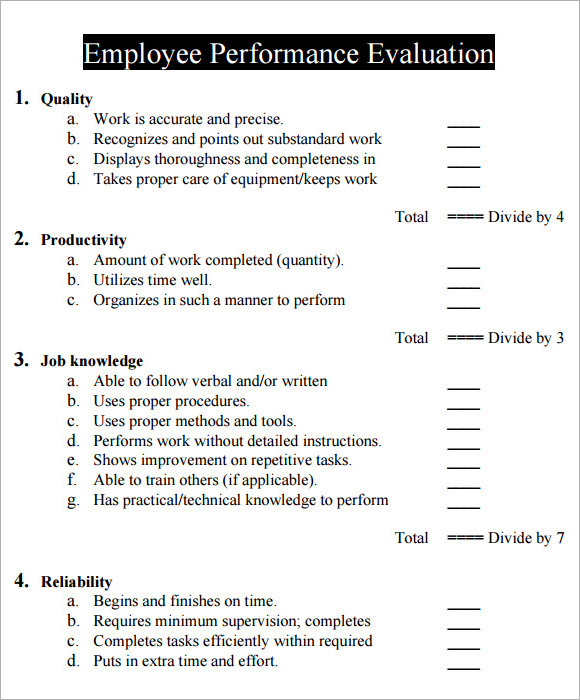 So, if you are an employer, you can evaluate your employees’ performance with the help of a performance evaluation form. 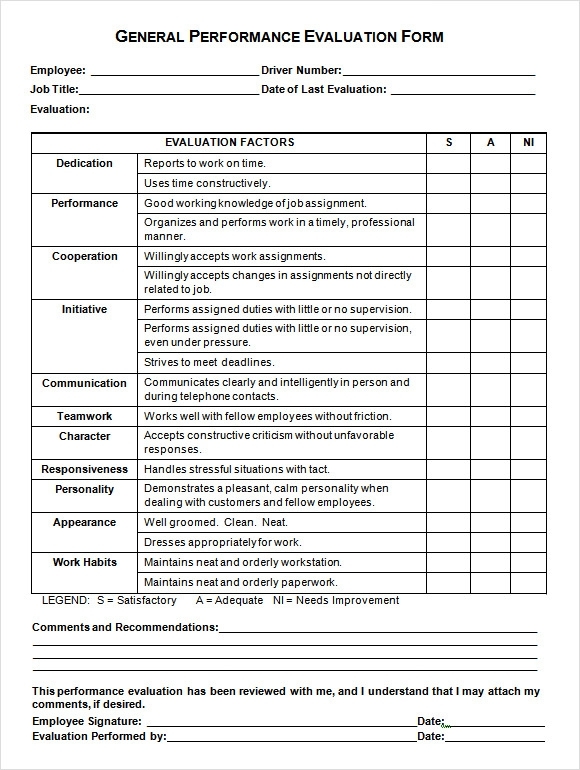 You may like Employee Evaluation Forms. When Do You Need a Performance Evaluation Form? Most employers use a performance evaluation form when the time comes to give promotions and appraisals. Filling up performance evaluation forms can be extremely helpful in judging the employees’ worthiness and seriousness towards the job. You can give the best appraisal to your best deserved employee, and give an ultimatum to the ones who are not performing up to the level. You may also need a performance evaluation form when you want to find out which field your employees are lacking behind in, so that you can start working towards their improvement. You can also see Job Performance Evaluations. 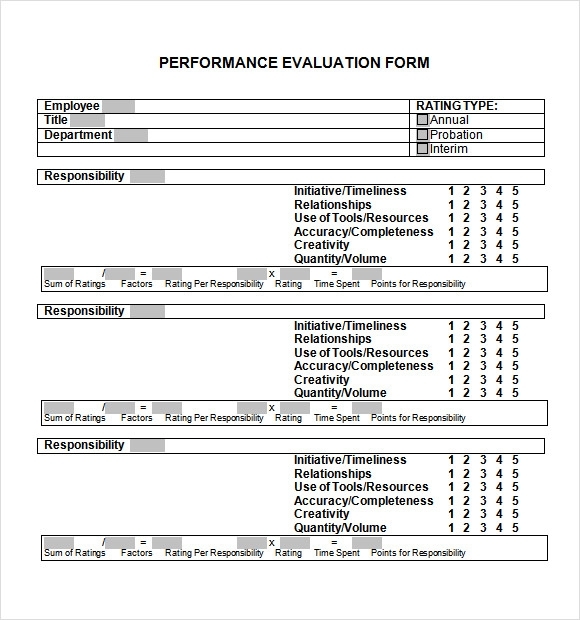 These performance evaluation forms contain all the elements that you need to consider while evaluating an employee’s performance. They are easy to download and use, and are available absolutely for free. These forms can be extremely helpful in identifying your best employees, and ruling out the non-worthy individuals. Even a new employer can get maximum benefit from these forms, as they need no technical or evaluation skills to use them. 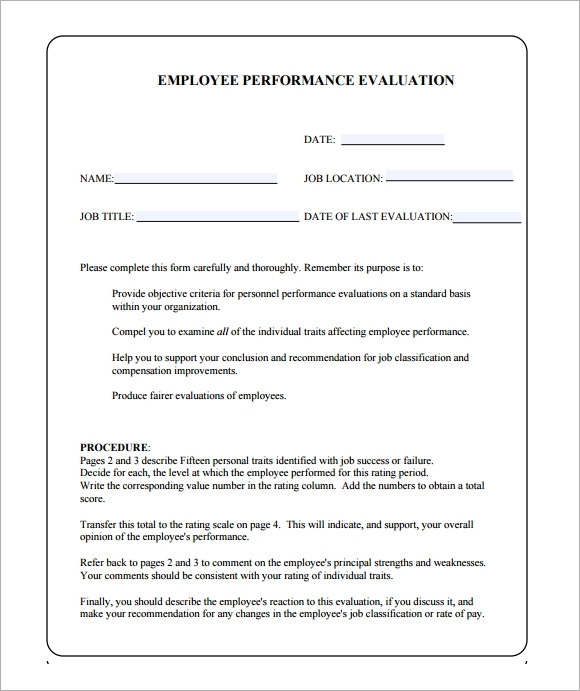 If you are an employer and it’s time to give away the appraisals, download one of these performance evaluation forms, and identify the most worthy employees in your company. By evaluating your employees’ performance, you can focus on the negative points and make your business better.